March 3, 2008: Morgan and I hike the Mountain to the west of our trailer. 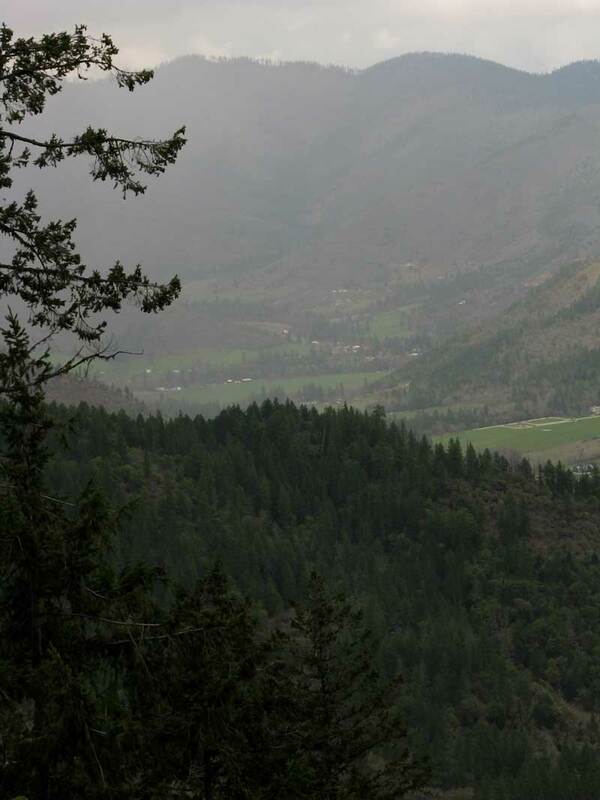 On the slope of the mountain, we can view the Applegate Valley toward Grants Pass, Oregon. 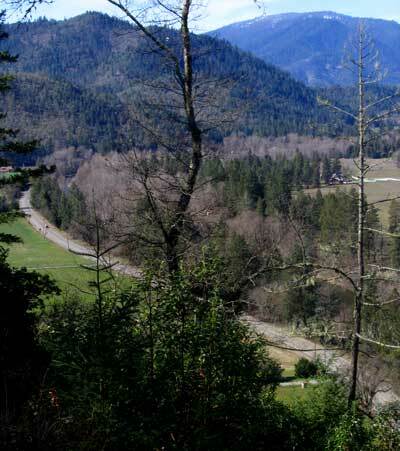 Highway 238 is parallel to the Applegate River just to the right of the road. Click to enlarge and you will see the river. March 4, 2008: Well! We ARE in Medford, Oregon aren't we? Here I am, walking down the street and this little car attracts my attention. It turns out to be a Lamborghini. You won't see them in Medford very often. I think I could safely say, this is the only Lamborghini in Medford. This car may be beautiful, but I'll bet it wouldn't tow a fifth wheel very far. 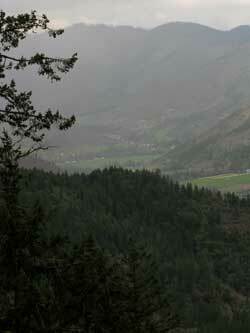 March 7, 2008: Only a mile from our trailer home, there is a view of the Applegate valley to the northwest. Beyond the first hills is the city of Grants Pass. The Bridgeview Winery is spread across the middle of the valley. 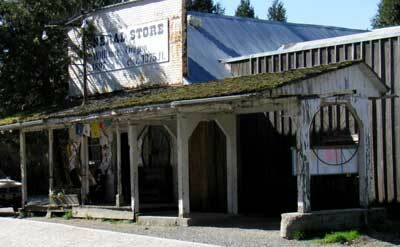 March 8, 2008: The Southern Oregon Historical Society maintains the Hanley Farm between Central Point and Jacksonville. The Hanley Farm was built in 1857. The Southern Oregon Historical Society maintains crops and methods of farming exactly the way it was done when the farm was built. 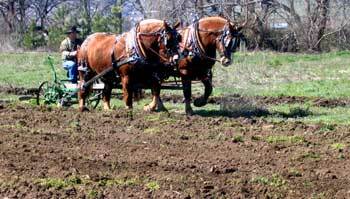 Today, we happened by the farm when some SOHS members were cultivating the fields using horse drawn plows. Click to enlarge the photo to see these beautiful horses at work. 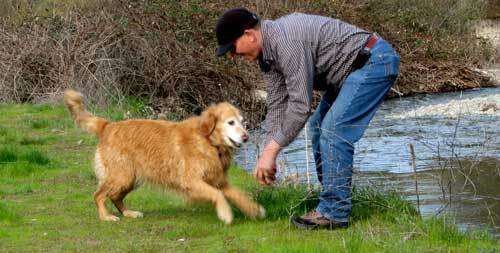 March 10, 2008: Only a few miles from Applegate, a farmer has a hobby which he has not developed yet. He is collecting scale trains, I figure about 1/4 scale. This engine is about 20 feet long. This appears to be a real steam engine but I don't think I'd want to be near when this tank is pressurized. Click to enlarge the photo. 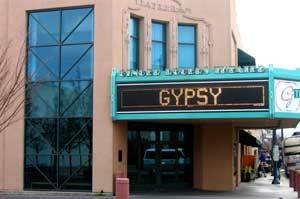 March 14, 2008: A couple of days ago, Gwen and I were able to go to the National Gypsy tour at the Craterian Theater in downtown Medford. Gypsy is a musical. Most of the show was concerning the early years of Gypsy Rose Lee, how she learned to be in the theater and then how she became a burlesque star. 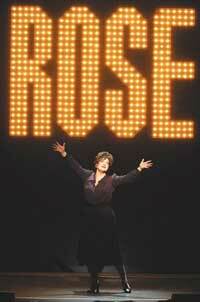 Rose is the star of this show and is the Mother of Gypsy. Ethyl Merman made this part famous in the 1950's while Bette Midler made the part famous in the 1970 movie. Kathy Halenda plays this part for the traveling tour. It was a sold out theater in Medford. In fact, I purchase our tickets four months ago and the show was nearly sold out at that time. Kathy did a great job and Medford gave her a standing ovation. It's not hard to imagine how tiring a tour like this must be for the cast and crew. You can click here for a short video to illustrate the show. March 16, 2008: It must be a cold evening. Morgan has moved her toy dog to the warmest spot next to the heater. Annie usually has that spot but since it's already taken, Annie has done the best she can do to keep warm. March 17, 2008: Wow! 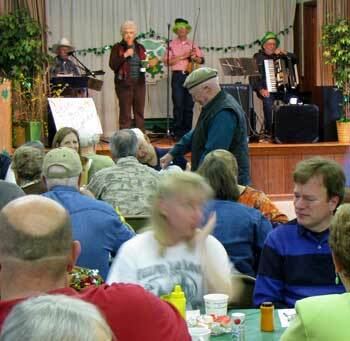 We had a great Corned Beef and Cabbage dinner at the Upper Applegate Grange. This is a tradition with the grange members and they have it down to a real art. Terry and Kathy drove us to the event in their new PT Cruiser. We not only got a great meal but some real Irish entertainment through the meal. We had a fun and relaxing time. Slide your pointer through the photo to the left to see how happy I am to be here. March18, 2008: Only about 15 miles from us is a small town named Williams. There is one store in Williams, the General Store. This store was built in 1897 and used as the first Post Office. It is rustic. I noticed what must be the original floor boards, because they are heavily worn uneven and rounded on the edges. You'll find snacks, drinks, and local organic produce. Be sure to ask for a copy of Williams Area Trail Guide by Evelyn Roether to learn of the secret trails in the area. 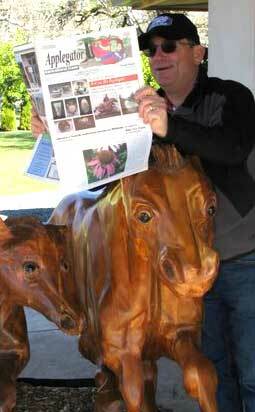 March 21, 2008: While walking through Jacksonville, Oregon, I began to notice the many works of art hidden in yards and businesses. This one was in very good condition so it's probably just been created. It appears to have been made from one solid piece of log. I would guess it was carved with a chainsaw but the work was carefully done and has a great deal of detail. It stands about ten feet tall. If you plan to visit Jacksonville you can make this your "quest". It stands in a public location but on private property. For those familiar with geocaching, you'll find this "treasure" at N42° 19.158; W 122° 57.535. Good luck. March 22, 2008: This evening, we had a dinner and card party with friends. From the left is Gwen, Betty, Connie, Mike, Dale, Kathy, Terry, Rich and Alice. It was Connie's birthday so that made it special. We took over the Applegate Mobile Home Park recreation room for the party. The card game was Texas Rummy, Gwen won. 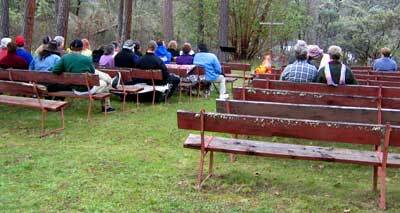 March 23, 2008: On this Easter morning, Gwen and I drove the short distance to the Applegate Community Church for the sunrise service on the hillside behind the church. 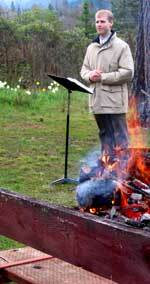 What a wonderful place for a sunrise service. The views are of the whole valley and the weather was cold but dry. Brian read several verses from Luke and we sang hymns just before dismissing to the gym for a hearty breakfast provided by the church. Note the field of daffodils behind Brian. March 24, 2008: After picking up my new Canon S5-IS, I drove up a National Forest Service Road, Ferris Gulch Road, looking for a photograph. It was late in the day and the light was fading fast. 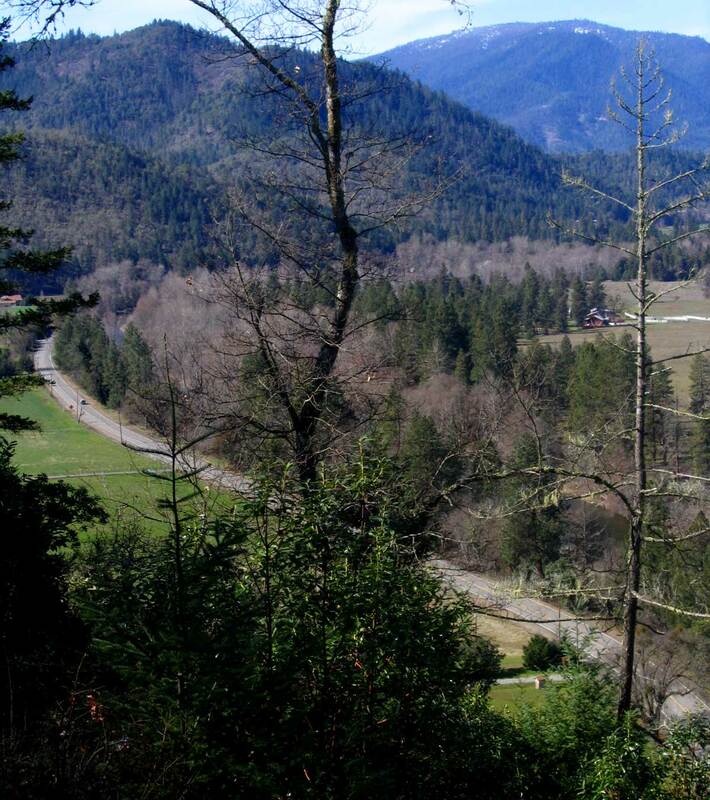 The road was steep so we (Morgan and I) gained altitude fast above the Applegate Valley. It was raining so the haze you see in the air is really rain. A new storm is approaching this evening so these mountains will likely be covered with snow by morning. Our trailer-home is on up the valley to the right of the photo about 3 miles. Grants Pass is about 17 miles down the valley to the left in the photo. You can click the photo to enlarge. March 25, 2008: You know how it is. You get a new camera, then you walk around trying to find things which need their photo taken. Today I found some tree blossoms while I was at the camera store locating a suitable carry case for the new camera. It's enough larger than my old Canon A-95, it won't fit the A-95 case. 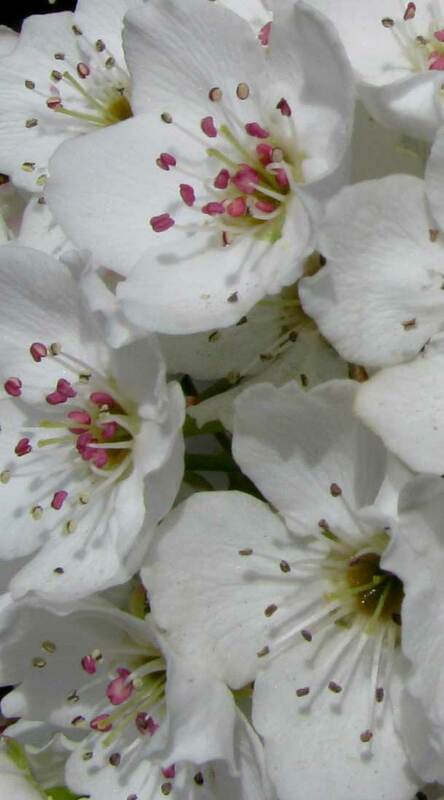 I purchased the same style, then spotted the blossoms nearby. You can click to enlarge the photo to see the detail. This was hand held on the Macro setting so I think I will try a tripod next time for an even sharper image. These were tiny, no more than an inch across. The Macro makes them appear larger. I did set the camera to manual focus then auto focus lock (you'd have to read the instruction manual). I also set the aperture at F8.0 (the smallest aperture on this camera), which gave a 1/400 shutter speed. Then I manually set the white balance to bright sun. I was hoping the small aperture would give me more range of focus. March 26, 2008: My cook, Gwen, is away for the week visiting her grandchildren. So, I must cook for myself. This may not look that great but it wasn't too bad. 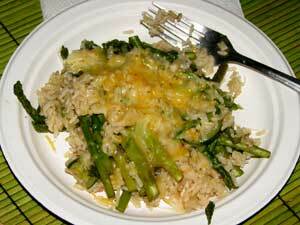 It's brown rice, fresh asparagus, some green onions from the bottom of the refrigerator, zucchini left over from the zucchini sandwich I made myself for lunch, some "Mexican shreaded cheese" (the last of it found in a bag in the refrigerator) and a little salt and pepper. I had two big helpings. I was pretty hungry having only a zucchini sandwich for lunch. Mmm! Good. March 27, 2008: This photo was taken by J.D. Rogers, the editor to the Applegator newspaper. Each edition, J.D. prints photos of all the places around Oregon and the world where readers pull out the Applegator to catch up on the news of Applegate, Oregon. J.D. took this photo while I was visiting Glenn Carter during his show at the Valley View Winery. I expect to see this photo in the next edition of the Applegator. It was a fun day for both Glenn and myself. 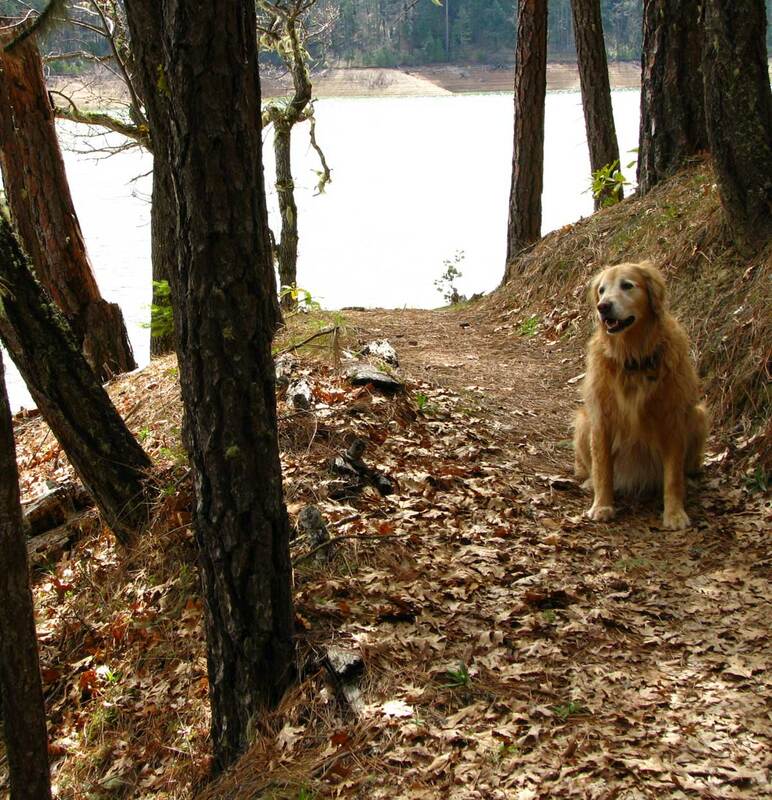 March 29, 2008: Morgan took me for a hike today around the shore of Applegate Lake. 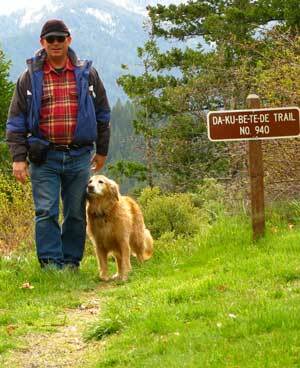 Actually, we only hiked a small portion of the Da-Ku-Be-Te-De Trail which really does circumnavigate the lake. Still, we probably hiked 6 or 7 miles and we were both glad to be back to the car. As it turned out, Morgan was covered with ticks so we spent some time removing and looking for them. This is a nice trail for hiking or riding a mountain bike. It is virtually level because is stays within 20 - 30 feet of the highest lake level. There was evidence of mountain bikes using the trail. It would make an equally nice mountain bike ride for the same reasons. Click on the photo to see an example of the trail. March 30, 2008: Spring is trying to happen in this yard. Perhaps whoever is responsible for mowing this lawn threw out some wildflower seeds so they could reply (when asked to mow the lawn), "and cut down all those great wildflowers?" Smart guy! April 1, 2008: Morgan obsesses over a tennis ball. We are playing at the edge of Thompson Creek, only a few feet from our trailer. When she gets hot from running after the ball, she takes herself into the creek to cool off. I paid Applegate Mobile Home park for only the first nine days of April. We will be leaving here on April 10. April 3, 2008: Tonight was the monthly meeting of the Rogue Valley Windchasers. Roy is the club President. The meeting is held in Grants Pass, Oregon at the Bistro restaurant. Here, Roy is showing off a combination stunt and trick kite, the Ghoul. This weekend is the club "fun fly" in Crescent City, California (on the ocean). It's about two hours driving time. Gwen and I are planning to attend if its not pouring rain. 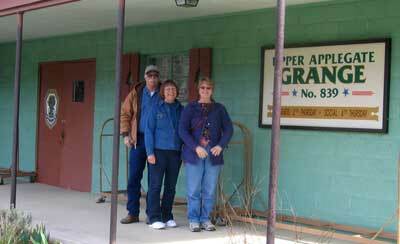 April 4, 2008: Today is the last Friday we will be at the Applegate Mobile Home and RV Park. I walked around taking notice of what's at the park. There are at least two manure spreaders being used as planter/decoration which may seem strange but what else do you do with old farm equipment. April 5, 2008: It takes about two hours to drive to Crescent City from Applegate. You must drive a two lane road known as the Redwood Highway. It is very scenic but "chilling" for the driver because it is very narrow and winding in spots. Gwen and I arrived at 11 am and several of the kite club members were already flying their kites. It was cold and threatening rain the whole time. Most everyone flew dual line or quad-line kites. Randy and I also flew single line kites which are flying behind the flags in the photo. 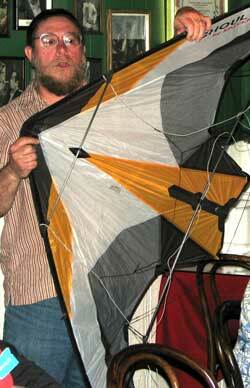 Randy had some great single line kites, some he made himself. I flew the dragon kite, the furthest in the photo. I had to tie a stick to the tail for added weight to keep it flying due to the heavy wind conditions. Click the photo to enlarge. Note the name of the club, Windchasers, on the front flag. 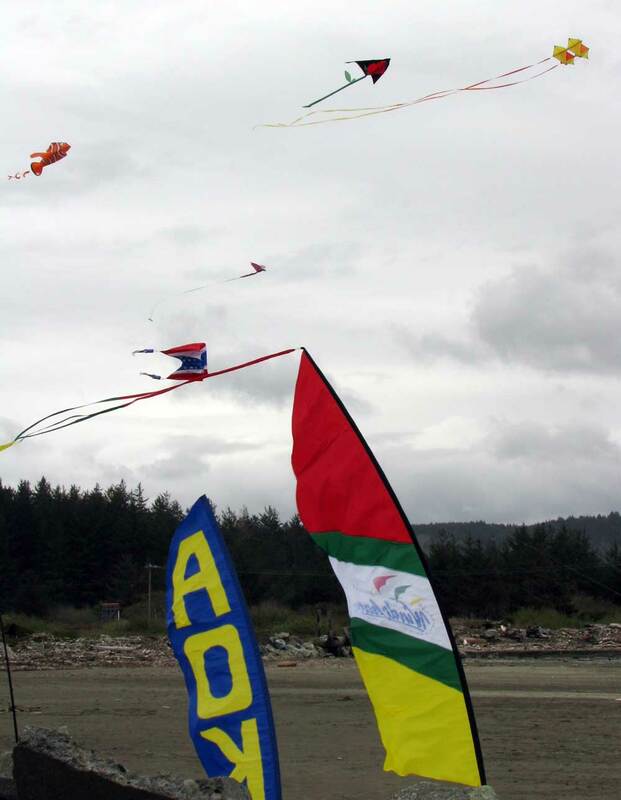 "AOK" is Associated Oregon Kiters. April 6, 2008: On our trip to the coast for the fun fly above, we stopped in the Redwood forest and found Trillium growing. It's always astonishing driving through the Redwood forest. I'm always expecting a dinosaur to peak around one of the huge Redwood trunks. 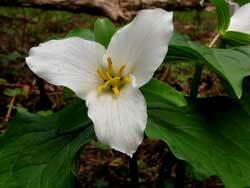 The Trillium fits right in. Click the photo to enlarge. April 10, 2008: We are hooked up and leaving Applegate. Our first stop is Seven Feathers RV Resort in Canyonville, Oregon. Four days with a Escapees Chapter 37 rally. Click the photo to enlarge.